Living in the tiny village of Fritchley as a child was a wonderful experience, but in all fairness, it was not what you would call the excitement capital of Derbyshire. In fact, excitement used to peak when a resident of the village acquired a new car, and when someone actually moved house, it was an event worthy of a village fete to mark the occasion! It did get quite exciting once when one of our neighbours got a new dog. Like you do, myself and my little sister were invited round to have a look at the little white bundle of fur that was rolling around on the carpet. 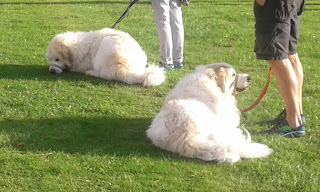 How lovely, a new friend, but, this was no ordinary dog, this was a Pyrenean Mountain Dog. What we didn’t know at that stage was just how big this bundle of fur, called Rebel, was going to become, and what the implications of that may be. Six months later, we had a polar bear living next door, it was gigantic, and it didn’t seem very friendly or indeed happy. For large parts of the day it had the run of the yard, but it was kept securely on a chain that was attached to the side of the house, which meant it’s span of attack was limited, as long as you knew where exactly the chain stopped. From time to time you would hear the gate go as an unsuspecting visitor entered the premises, this would then be followed by the sound of a chain dragging across the floor and then an almighty roar as Rebel decided the latest intruder was going to turn from visitor to victim. The system worked, and no one was maimed by the 'Beast of Bullbridge', until one day when the papergirl made her regular visit, this time, as usual, Rebel leapt into action, the chain picked up pace but then disaster. As pebble dashed render fell from the weakened wall, Rebel was free, and the poor girl was about to have a life changing experience. Her arm took the brunt of it, but she battled free, and even managed to deliver our paper, a blood spattered Derby Evening Telegraph popped through the door. But for Rebel, alas his days were numbered, we never saw him again after that, the incident was never talked about either, not publicly anyway. 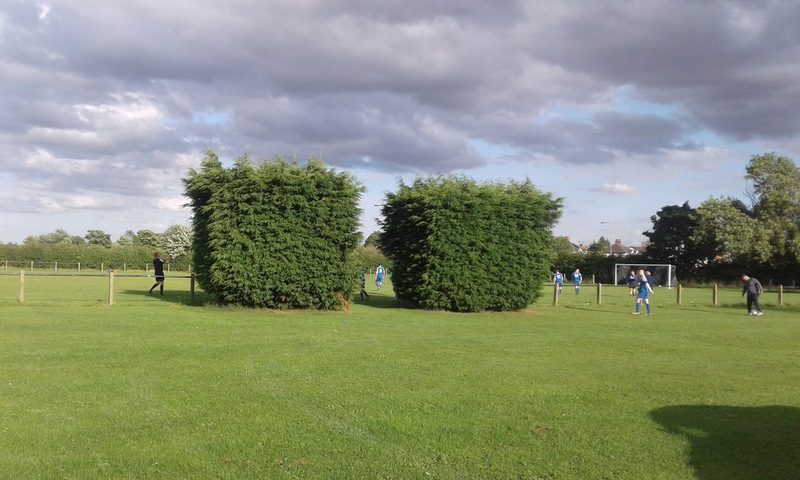 What on earth has that got to do with a game of football at Kirk Deighton Rangers you might be wondering? More on that later, but first, who, what and why? KDR have been promoted to the West Yorkshire League this season after winning the Harrogate and District League last term. 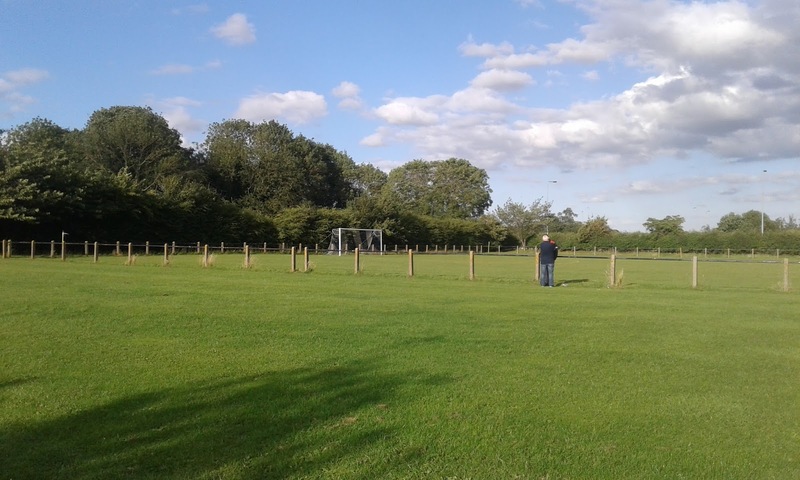 Also joining them are Knaresborough Celtic and Hampsthwaite United, where I will visit later in the season, but for now, having seen from their very informative Twitter account that they had a friendly this evening, I decided to take a look early doors. 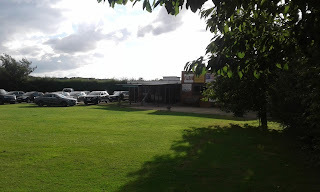 Kirk Deighton is an attractive village just at the side of the A1, on the northern edge of Wetherby. The ground is pretty much the first place you come to on the right hand side as you enter from the South, and it's a picturesque affair. The clubhouse and dressing rooms sit aside the small car park, and a short walk away is the railed pitch. One interesting feature is the fact that two large tree / hedge growths sit side by side on the half way line and form a strange kind of players tunnel to the pitch. Unless of course you choose to simply climb over the barrier! They were a friendly bunch, so much so they let me sit in their dressing room while I had a pint. To be honest though, that wasn’t strictly the case, the home dressing room was being refurbished, and within a few minutes of being served the players were changing in what was the bar. I was the only non-player in the bar, so feeling slightly awkward I went outside. Leeds Modernians play in the middle tier of the three tier league, and found themselves a goal down early in the game as KDR started powerfully and positively. But, as the half wore on it was the visitors who gained the upper hand and scored twice to take a half time lead. Modernians scored three more times in the second period to record an easy victory, but KDR can take some credit from their performance, I can’t see them struggling in the step up, they perhaps just need to acclimatise to the new surroundings. So, what’s the significance of the dog then? I turned round and just as I was giving my answer, a couple were walking towards me with TWO Pyrenean Mountain Dogs on leads, or, gigantic polar bears to be more precise. Instantly I had a flashback to Rebel, I barely saw the game for twenty minutes, my eyes were transfixed by these two killing machines. All I could see though was the blood stained newspaper, all I could hear was the sound of that chain being pulled across the yard, it was like I’d been taken back 35 years to that fateful day. The owners and the dogs eventually left, I could relax and enjoy the game, but Rebel was still emblazoned in my mind. Mind you, I never did find out what happened to the poor paper girl, but I very much doubt she’s living anywhere near Kirk Deighton…. Polar Bears - Two Of Them!